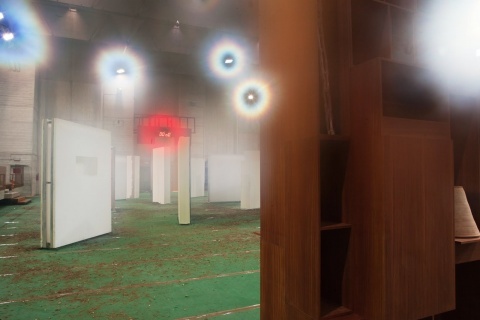 This past June, Curator Gary Carrion-Murayari visited the 55th Venice Biennale and was particularly struck by the joint Cypriot and Lithuanian Pavilion, united for the first time this year at a sports center tucked away from the main staging grounds of the Biennale. In an effort to unpack the exhibition’s title, “Oo,” Curator Raimundas Malašauskas describes the concept as “a slightly asymmetrical structure conveying uneven, yet mutually open elements.” Read Carrion-Murayari’s reflections on an exhibition that manages to subtly examine national identity through unexpected collaborations and cohabitation. In this year’s edition of the Venice Biennale, one of the most pleasantly disorienting experiences is the joint pavilion of Lithuania and Cyprus, organized by the Lithuanian curator and writer Raimundas Malašauskas. 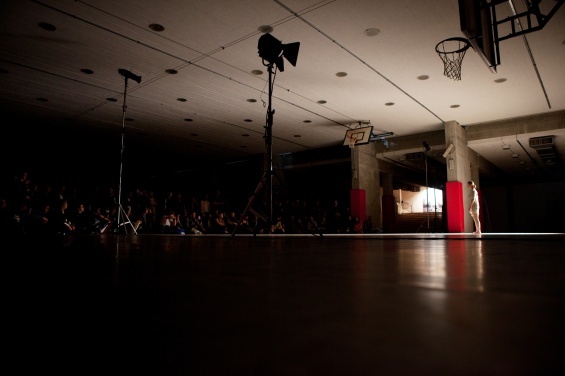 Titled “Oo,” the project takes over the Palasport Giobatta Gianquinto, a public gymnasium near the Arsenale. The perimeter of the Palasport site is surrounded by a windowless, cast-concrete wall. Built in the 1970s, this complex is a rare modernist structure among the historical styles that Venice is known for, its austere grey armature incongruous in the landscape of picturesque canals and palazzos. Despite its cold appearance, the Palasport is actively used by the local community throughout the year—another contrast to the typically temporary pavilions at the Biennale, which rarely occupy spaces that maintain a function outside the confines of the biennial art audience. Malašauskas populates the vast gymnasium and the dimly lit corridors that surround it with a selection of works that echo the building’s unique architecture and the serial physical movements that are typical of the venue’s normal use. This contrast is palpable to Biennale visitors and local athletes alike, as the daily sporting activities of the gym continue to take place throughout the exhibition. As the unusual capitalization of the title implies, “Oo” (sometimes also written by the organizers as “oO” or “oo”) stresses the experience of asymmetry and its effect on perspective. Malašauskas deploys uneven structures throughout the written materials that accompany the exhibition (presented through an extensive website and Twitter feed), as well as through the juxtapositions of artworks and their contexts. A curatorial statement tells us to “Take Oo as a lens: zoom into Palazzetto and you may notice a grand detail belonging to a whole that opens up as a detail within a detail. oO becomes Oo and oo. Zoom out and you will bump into flying gymnasts or another rebound ball. Bounce it back carefully—you are in the place that has its own changing rhythms and a character: the favourite venue of physical exercise in Venice. The bouncing between two national pavilions and flights of exercise sets the rhythm of oO.” The stress is on cohabitation here, on things existing together and maintaining their difference but not their isolation. Thus, eleven artists from Lithuania and Cyprus represent their respective nations along with four Americans and one Dutch. The artworks include a series of objects, installations, performances, and proposals installed throughout the stark Brutalist structure. Among the most striking works in the exhibition, Maria Hassabi’s performance Intermission (2013) took place across the enormous bleachers on one side of the amphitheater, with dancers shuffling, crawling, and rolling slowly through Phanos Kyriacou’s enigmatic Eleven hosts, twenty-one guests, nine ghosts (2013), a field of humble objects (a broom, the back of a chair) suspended by vertical supports. Gabriel Lester’s sculptural work Cousins (2013) divided up the main court with a group of modular walls borrowed from various museums throughout Europe and served as a kind of architectural structure for other performances, which are taking place over the course of the exhibition. Other sculptures took the form of physical extensions of the material surfaces of the building itself. 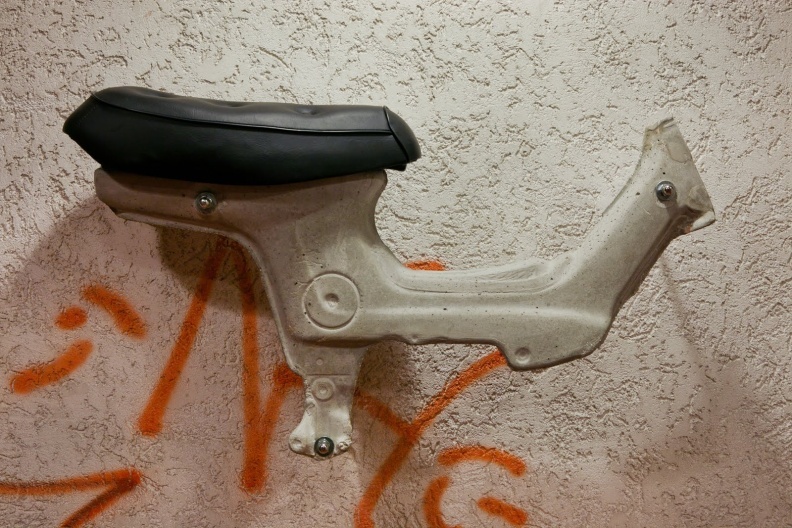 Jason Dodge’s Apricot tree – Plant Life and Pine (2013), filled a wooden entryway into the main gymnasium, while Constantinos Taliotis installed his sculpture, The Day the Chaly Stood Still (2013), a concrete skeleton of a motorcycle, directly onto one of the building’s rough interior walls. 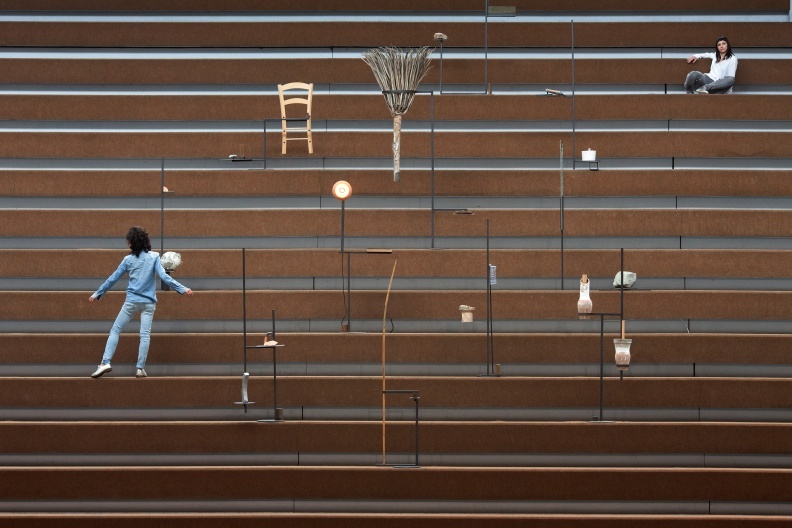 Over the course of the exhibition, a series of other performances and events fill different locations throughout the space and offer a constantly changing experience for the viewer. These works and others encapsulate Malašauskas’s main achievement in the pavilion: the activation of an unexpected Venetian landmark through a shadow sequence of objects and images that both feeds off and distorts the location’s apparent singular nature. The works in the pavilion do more than just appropriate this historical building to provide a setting for otherwise disconnected objects. 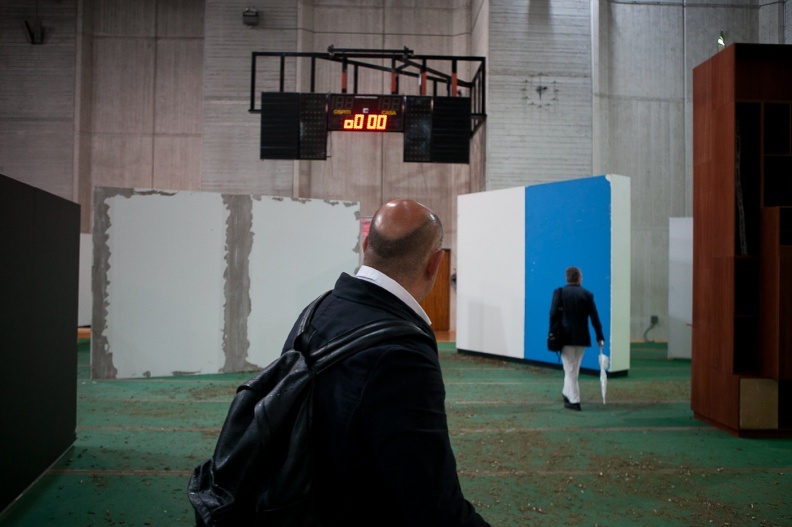 Rather, Malašauskas and his collaborators fracture and expand the experience of time and physical activity that a Biennale visitor might expect from a public space such as the Palasport. Raimundas Malašauskas’s full curatorial statement can be found here. 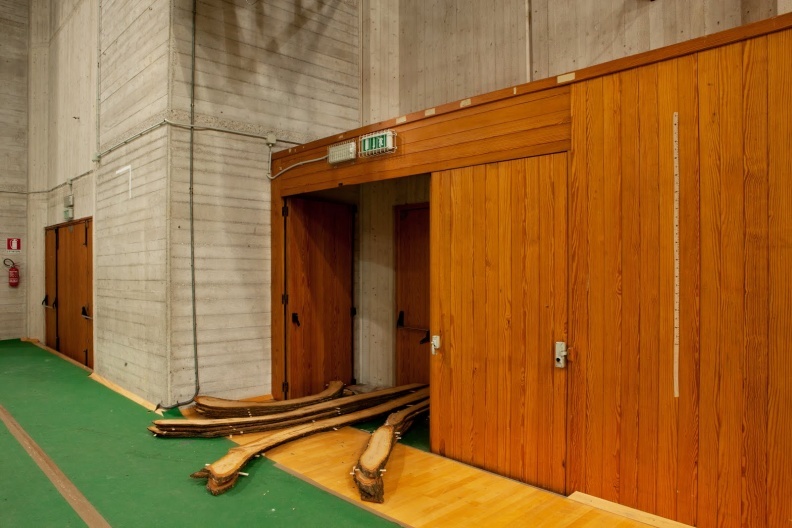 While the Lithuanian and Cypriot Pavilions are united in the space of the Palasport, online they cease to cohabitate with two distinct websites: The Lithuanian Pavilion is oo-oo.co and the Cypriot Pavilion is oo-oo.bo. The pavilions’ websites also go well beyond what is typical (a curatorial statement and event program) to really utilize the online space by hosting an involved program of texts and media. With content that preceded the physical exhibition and continues to develop during it, the two online websites feed in and out of the actual pavilion’s immersive environment. On the Lithuanian website, there are contributions from Lithuanian artists and writers, as well as those of other nationalities. 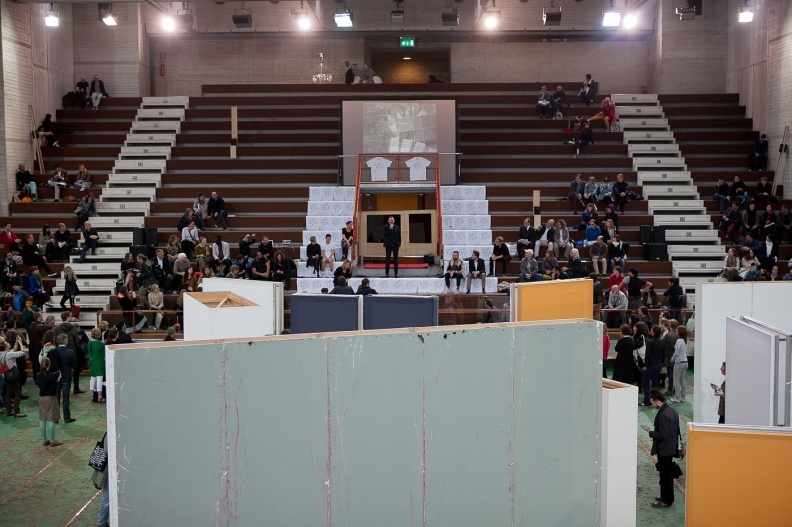 A timeline from 1973 to 2013 weaves together the history of the building and activities of the gymnasium with the development of artworks in the exhibition and the merging of the two countries’ pavilions. Further, in the short video work “Oo, a preview,” a book reading turns into a hypnotic induction. There’s also an obituary for a “long-dead illusionist” by Egyptian artist Malak Helmy and an interview between Lithuanian Valentinas Klimašauskas and Darius Mikšys. On the Cypriot website, visitors will find contributions from the five Cypriot artists in the exhibition, Lia Haraki, Maria Hassabi, Phanos Kyriacou, Constantinos Taliotis, and Natalie Yiaxi. Additionally, for past work by Raimundas Malašauskas, visit the website for his 2012 book, Paper Exhibition. Some Ten Years of Writing.